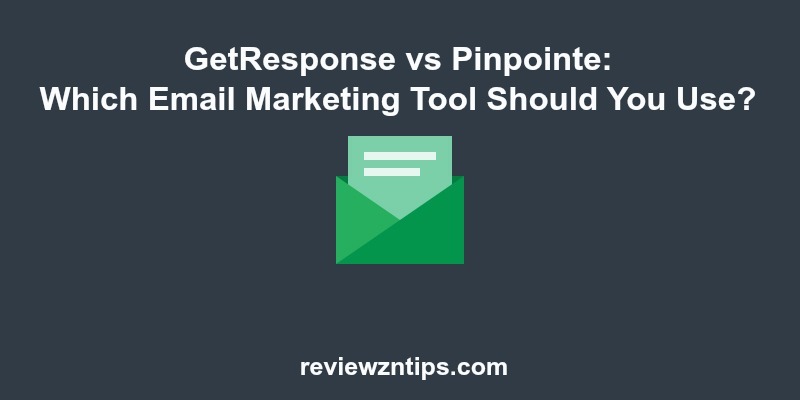 GetResponse vs Pinpointe: Which Email Marketing Tool Should You Use? the money is in the list. So you want to create a newsletter, but which email marketing provider should you use? In this article, we will talk about two popular platforms that you can use for this purpose: GetResponse vs Pinpointe. What is a newsletter and what are its objectives? A newsletter is an email, containing updates and general information, which is sent periodically (and most of the times free) to all the people who signed up to receive it. A newsletter is vital to creating a connection with your audience, in order to keep them up to date on the latest news of your blog, deliver suggestions and ideas, send targeted offers, and more. The newsletter should be used to give added value to your subscribers with ebooks, courses and interesting material. Doing all this requires of course time and dedication, while you should also focus on many other aspects of your site. So how can you take advantage of such a powerful tool while optimizing your time? The answer is simple. You must automate (part of) the process, by creating a series of emails that will be sent automatically to your subscribers. So let’s see in details what GetResponse and Pinpointe have to offer. With GetResponse, you can manage your mailing list and create professional email campaigns, plus, there are several tools specifically built to be more effective in engaging your audience. You can use any of the +500 email templates available, to build the perfect design for your business. Once you’ve chosen, you can adjust it, adding photos and images (there are more than 1000 free iStock pictures available), add buttons or text blocks, using the drag-and-drop editor. You don’t need to be an HTML expert to use this email creator tool! GetResponse offers different methods to import your subscribers and manage your contacts. Once you have created your email, you can check the preview to discover how will look when delivered and opened in different email clients. A feature I particularly like is the Time Travel scheduler, which is really helpful when traveling around the world, but still getting your emails delivered at your subscribers at the same local time. There are many beautiful ways to create sign-up forms to gain new contacts, using the templates available, even embedding them on your site or even your Facebook fan page. 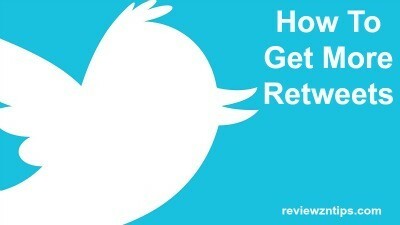 Need a way to boost traffic and conversions to your site? Read this post. Granting a 99% of email deliverability is great, right? (Data taken from a research of Return Path). Getresponse offers that, as working with ISPs for instant whitelisting. In order to avoid spam emails, they also have an anti-spam policy and a series of tools to help you avoid sending unwanted emails. Of course, they also automatically processes unsubscribe requests, complaints and bounces. I like the in-deep tracking and reporting tool offered by GetResponse (included Google Analytics). I’m talking about hour-by-hour metrics, email comparison and segmentation tools. Use the autoresponder to create automatic follow-up emails to engage more with your audience. There are a survey and poll feature to build online surveys to run a market research. Add social sharing buttons to your newsletter and benefit from reaching new contacts by using the social profiles of your subscribers. GetResponse is the first email service to provide a complete webinar marketing solution, specifically created to increase conversions and engagement rates. There are different prices, according to your list size. 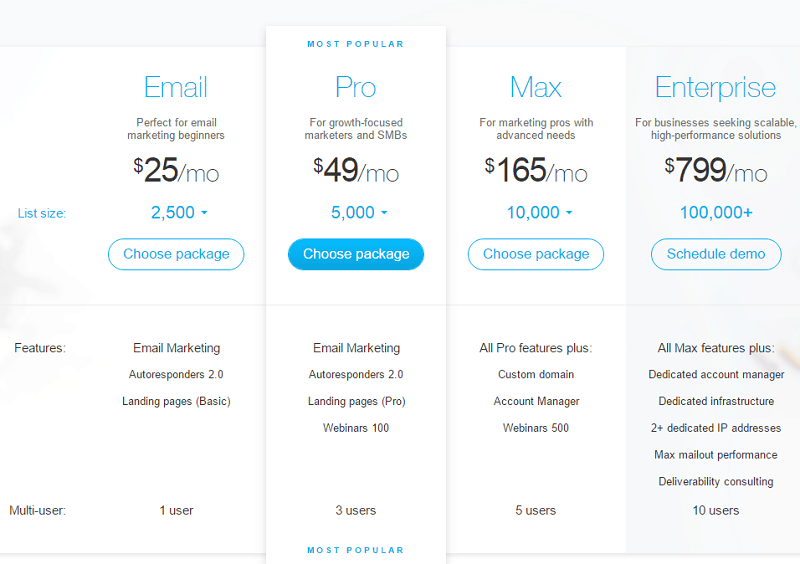 For example, the basic plan of GetResponse (called “email”) gives email marketing, autoresponders 2.0 and landing page features, with a list size of 2,500 contacts and unlimited emails, with just $25/mo (which is almost half of what PinPointe is asking for their basic plan). Pinpointe can be a valid solution for your email marketing. Let’s look through the different features. Pinponte has more than 1000 templates to choose from, according to your needs, categorized into email newsletter or ecommerce email templates. All 100% mobile responsive (which means the design will adapt itself to the screen of the user, whether it’s laptop, desktop, tablet or smartphone). Considering more than half of emails are now opened on mobile devices, you want to use a responsive design. The WYSIWYG editor is simple to understand and you can easily modify the ready-made template. Pinpointe offers a comprehensive segmentation tool that you can use to tailor your campaigns. It’s a good strategy to segment your users, as you can send personalized and targeted offers, based on your subscribers’ interests, age, gender and geographical area. You also have the option to schedule messages to send on holidays or other dates, or simply target specific users, resending campaigns that were not open in the past. There’s a good spam checker to scan your emails before sending. You may also want to increase the readability of your messages by checking how these emails will look like in different email systems. Of course, Pinpointe maintains a list of blocked email addresses and contacts that have reported the campaign as SPAM, so you don’t risk to bother those users with your mails (you may also want to create your own blocked list). This is an important part of your email campaign. With the integration service with Google Analytics, you can track clicks, transactions, conversions and other stats. Pinpointe offers also a reporting feature service, specifically created for B2B professionals. You can build “digital footprints” and track all the actions of each subscriber in relation to your messages. 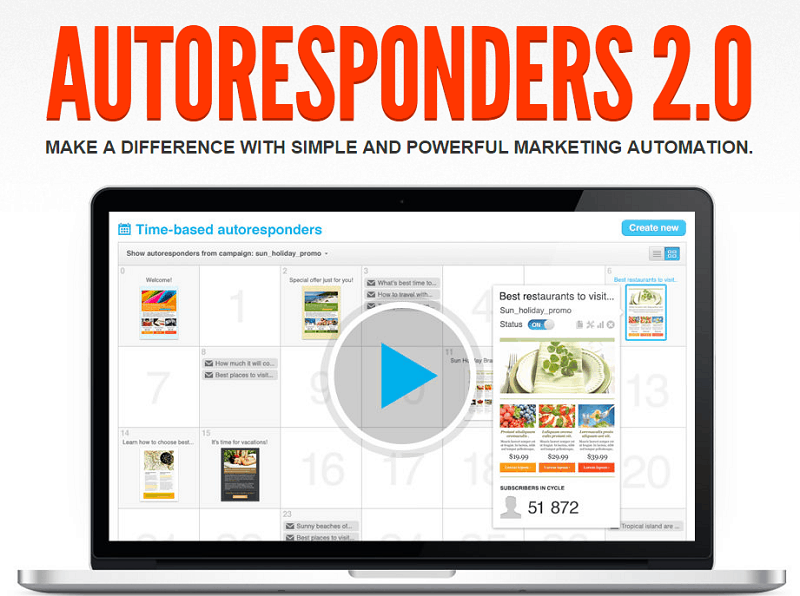 The autoresponder is easy to set up. There is also a free survey service with the option to send out polls. Prices are based on the number of active contacts in your mailing list. The basic plan starts a $49/mo, for up to 5,000 contacts and 40,000 monthly emails send limit. Personally, if I need to make a choice, I’d go with GetResponse. Why? In a few words, they offer more for less money. You can get what PinPointe offers (starting at just $25/mo, which is half of PinPointe basic plan). Plus, you may want features like webinars, which PinPointe does not offer, paying $49. Also, you get the multi-user option, which lets multiple users managing your email marketing campaigns and GetResponse account. Have you ever worked with GetResponse or PinPointe? Eventhough it is a paid tool, free version contains some pretty useful features too. What do you think about this tool? I know MailChimp, but never tested it. What’s your feedback of their service? It is really nice Erik..
Actually the MailChimp dashboard give us a clear statistics about sending mails, performance improvement, etc. Based on that we can create and work on our campaign. Also, we have the option to choose whether everyone on our list gets the email or a specific segment only. So, Really it is helpful for me. Glad to hear you have a positive experience with MailChimp, Mahalakshmi. Are you using the free plan? Yeah.. I am using the free plans now. But I am planning to buy the paid version as soon as possible. That’s great you are so happy with the MailChimp free plan, you wish to upgrade soon to a paid version, Mahalakshmi.